SS. Boris and Gleb (Kalozha) Church in the city of Hrodna is part of the Tentative list of Belarus in order to qualify for inclusion in the World Heritage List. The Saint Boris and Saint Gleb Church (Borisoglebskaya in Belarussian, but also called Kalozha Church), in the city of Hrodna (also spelt Grodno), in Belarus, was built in 1180s on the high right bank of the river Nieman. 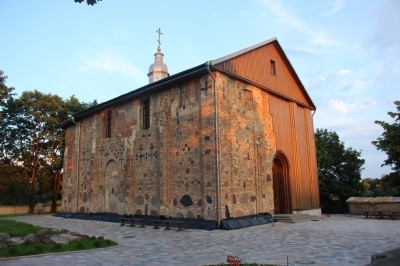 It is a unique example of ancient stone architecture and is one of the oldest building standing in Belarus. The original walls were made of brickwork of different size an colors, including large colored, face polished, granite and gneiss stones, and figured glaze-covered ceramic tiles of various sizes, shapes and colors (blue, green, ras), which form various geometrical figures and crosses. The southern wall and part of the western wall was destroyed by a landslides and the southern apse collapsed in 1853. Repair works were carried in the 20th century, with riverbanks being stabilized and the southern and western walls rebuilt using simpler modern materials, mostly wood. The end-result is peculiar with a church cut into two halves : an original complex bricks half (left on the picture) and a simpler modern reconstructed half (right on the picture). There are plans to restaure the southern wall to its original aspect however. At the present, it is a small active place of worship, so dress modestly. I came on a Saturday morning at he time of the mass, to be sure to be able to look inside. Mass hours are written in front of the church. Visiting at time of mass is also very atmospheric, with priests singing holy incantation. It is withing wallking distance from the city center. Getting to Hrodna, I rented a car, but bus and train seem to be easy to use. It takes three to four hours, so I planned ia as an overnight trip. The car let me make a few detours to tick two Struve Geodetic Arc WHS points, to check the very northern part of Belovezhskaya Puscha WHS and to see two « edifices of worship of Fortress Type in Belarus » TL on the way, and also drive to Augustow Canal TL. Driving in Belarus is not as bad as described in most guidebooks. All signs are in cyrillic though, so check you final destination in that alphabet before hitting the roads.